← A pair of particularly perfect peppers! We’re almost but not quite at our salad time of year when customers forego the hot soups for crispy, fresh summery salads. It seems that winter does not want to leave us just yet though and our Pasta Fagioli (Bean Soup) is still going down well with everyone. Today we are featuring a couple of delicious dishes, one being our fantastic Capri Salad with Buffalo Mozzarella and fresh rocket. 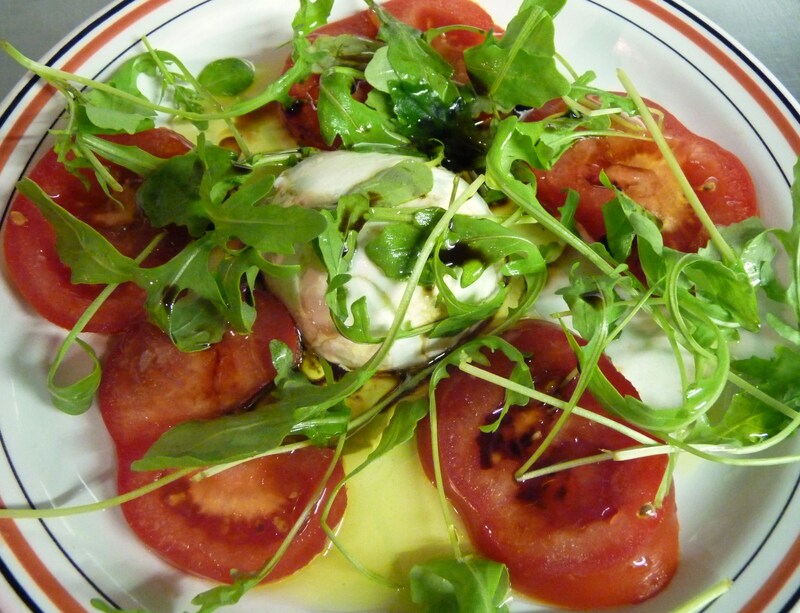 Using the best of ripe vine tomatoes, fresh buffalo mozzarella, fresh basil and rocket, it is dressed with the best of Extra Virgin Olive Oil and balsamic vinegar to create a simple but tasty summer dish. Try this with our hot Italian bread as your starter, nice glass of chilled white wine and I’m sure you will love it! Delicious, fresh, healthy, what more could you want?! Now onto your main course and what a dish this is. This is Spaghetti with Spicy Italian Sausage and believe me, it tastes even better than it looks! 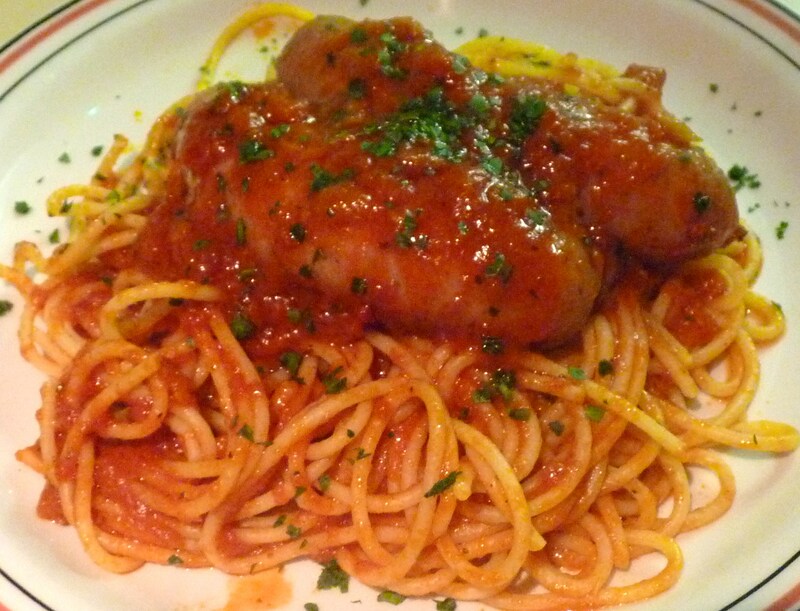 These 100% all meat Italian sausages are cooked in Costanzo’s own Napoli Sauce and served with spaghetti al dente. Be aware, the sausages are spicy so not for those who like their food on the mild side! They are extremely filling so make sure you leave enough room for them after your starter. Very, very popular dish with everyone and rightly so. You just have to mop up the sauce with the Italian bread again so guaranteed you will leave at the end of the evening with a full stomach, most probably have an air of garlic about you but hey, who cares! Life is too short to worry about garlic breath! We had a great week in the Caprese last week. Lots of new faces discovering us for the first time and lots of our customers from the past popping in for the first time in ages. It’s funny to see the looks of amazement from our old customers when they see how good The Caprese looks now after refurbishment. We’re used to our new look now and love it and thankfully the majority of people agree with us. Another busy week ahead for us, especially tonight when we are fully booked with a big party of 60 of one of our regular broker firms whom we normally see on almost a daily basis but usually in smaller numbers! Tonight they will be dining well on starters of Risotto with Wild Mushrooms, Capri Salad with Buffalo Mozzarella and Agnolotti with Napoli Sauce followed by Fillet Mignon, Spaghetti Tiger Prawns and Veal Cordon Bleu. If they have room after that feast, some delicious sweets and coffee will be on offer and of course excellent choices in wine. Looking forward to a great evening as they know how to enjoy themselves and we are sure that it will be a late, late night tonight for everyone!